After much searching, I found out that this error indicates that something in the NIB/Storyboard has an outlet called “staticDataSource” in the MasterViewController class. I looked through all of the outlets in my storyboard, and found nothing. I grepped every file in the project for “staticDataSource” and found nothing. I randomly tried adding a property to MasterViewController called staticDataSource (I made it an NSSet), and the app stopped crashing, but didn’t show my static cells. Finally, in a random effort, I changed MasterViewController back into a UITableViewController subclass (I had changed it to a UIViewController), and everything worked perfectly. So apparently, despite what you may read, static table views do in fact need a data source, and making your controller a subclass of UITableViewController automatically provides you with the needed property. This entry was posted in Uncategorized on February 28, 2012 by alwold. 1password – this one is huge. It’s expensive, but worth it. It keeps track of all of your passwords and allows you to stop using the same password on a bunch of web sites. Meerkat – SSH tunneling. Works great, but is a bit pricey. Mental Case – great flash card app with iPhone support. The syncing is a little clunky, though. Wunderlist – To do lists. Also an iPhone app, but the syncing seems a little buggy right now. DBVisualizer – Database client. Works on pretty much every database. Anyway, I would recommend all of the apps in this list. They are all critical to my productivity. The ones that are not free are worth the money, in my opinion. This entry was posted in Uncategorized on September 13, 2011 by alwold. Yesterday, Apple released an update to Java for OS X. I had trusted a self-signed cert with my old java installation, and it stopped working with the update, so I had to figure out how to add it again. It’s not very hard, but kind of tricky to figure out, so here you have it. you’ll be prompted to trust it, then you are done. 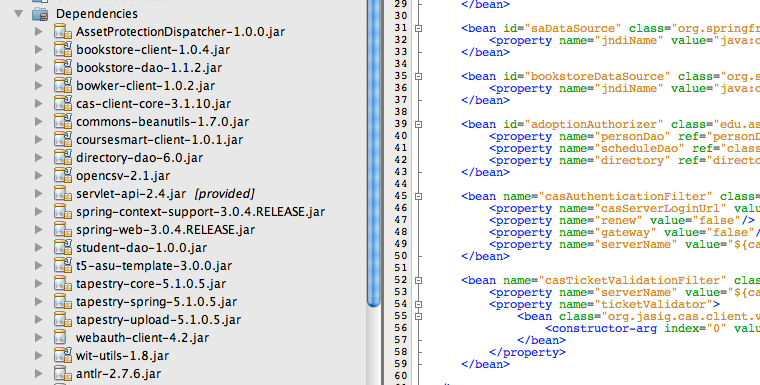 …then, the cacerts file is located under there, in jre/lib/security. Also, as Evan T pointed out in the comments, the password is “changeit”. This is pretty much universal for all JVMs I’ve used (including Linux/Windows). And one more thing. It’s a good idea to specify a -alias parameter when adding the certificate, otherwise it gets added under the alias “mykey”, then if you try to add another one, you get an error, since it’s trying to add another “mykey”. This entry was posted in Uncategorized on June 30, 2011 by alwold. This entry was posted in Uncategorized on June 3, 2011 by alwold. When I first started working with Java to do real work, the servlet spec was pretty immature, and I was coming from a world of cgi-lib.pl and PHP. Things were quite simple. You wrote a class that had a method that received GET and POSTs, called some simple methods to get the decoded query string parameters, and printed out the results. It was easy to learn, but the code was not pretty or well organized. Calls to the database were simple, ugly, and prone to connection leaks. They were easy to write, however. Fast forward to 10 years later, and in order to write a “clean” Java web app, you need to be using an MVC framework, persistence APIs, etc. This involves pulling in a complicated tree of JAR dependencies, composing complicated XML configuration, and implementing highly abstracted interfaces which require quite a bit of thinking to get your head around. I can’t help but think if I were just getting into Java right now, I’d be intimidated almost to the point of giving up. Java is still pretty solidly established in the “enterprise” space, so I don’t see it disappearing anytime soon. If you want to look to the future, however, it is probably wise to take a look at what the smaller companies and startups are doing. They have the benefit of starting fresh and being able to use the technologies that most effectively support their goals, without having to port existing stuff/retrain staff. Java is present in those environments, but other technologies seem to be far more well represented. I wonder how much this has to do with the Java community’s progression over the last several years to the point where it is highly complicated and difficult to learn. This entry was posted in Uncategorized on May 9, 2011 by alwold. I purchased one of the new MacBook Pro’s that were released in April, and I’ve been really liking it. Mostly it just offers improvements to some things that were getting annoying about my old one. It has more memory, a higher resolution display, and the unibody case is cool. In any case, the battery life is nowhere even close to the 8-9 hours they advertise. As a result, I was curious about how often it was using the high powered discrete NVidia graphics chip, so I started looking with system profiler, and it was pretty much always running. With some experimenting, I found out it was mostly because of Google Chrome. 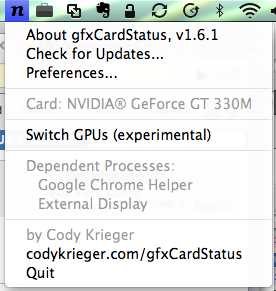 It would be cool if Apple released some tools to fine tune the graphics switching, and I imagine they eventually will, but for now there is this cool program, gfxCardStatus, which has really advanced quickly since it was released. One thing that is really cool now is that it shows a list of programs that are causing the system to use the high powered chip. This entry was posted in Uncategorized on May 10, 2010 by alwold.